Early this week I found out the answers to some troubling questions about my health. It turns out I have POTS–or Postural Orthostatic Tachycardia Syndrome (you can see why POTS is easier lol). Basically, whenever I stand up or stand/walk for long periods of time, my blood pressure drops and my heart rate speeds up. This causes frequent dizziness, chest tightness, weakness, fatigue, and fainting. My case is mild compared to others I have read about. I have passed out a few times though, and it’s very hard to keep up with my fellow active friends this way. I want to bring attention to POTS for many reasons. The number one reason is because POTS is actually more common than one might think (especially in young women), but frequently misdiagnosed or mild enough to not cause troubling issues. I used to think I was just imagining things or lazy because I never wanted to do anything but sleep all day. I can’t work right now because of the fainting that comes with the physical demands of part-time jobs, but I know that it should get better in the future. If any of you are having these symptoms please see a cardiologist who knows about this disorder (and who can rule out other diseases). I am so blessed to have a doctor who knew what he was talking about! I also want to bring attention to POTS because I know that God can be glorified through my illness. I know that He is working His healing in my life. Right now I have to wear compression stockings for better circulation and take a pill to raise my blood pressure. Hopefully, this will not be permanent. I’m allowing Jesus to take care of me and use me to inspire others living with a chronic illness. Another interesting thing I learned is that this is probably related to my IBS. Apparently they are both disorders of the autonomic nervous system, and that many patients will have both together. Again, if you are having these symptoms please educate yourself and see a physician who is educated on these disorders/diseases. No matter what I face, I know that God is with me. As long as I keep seeking His face, I know that I will always go forth and conquer! 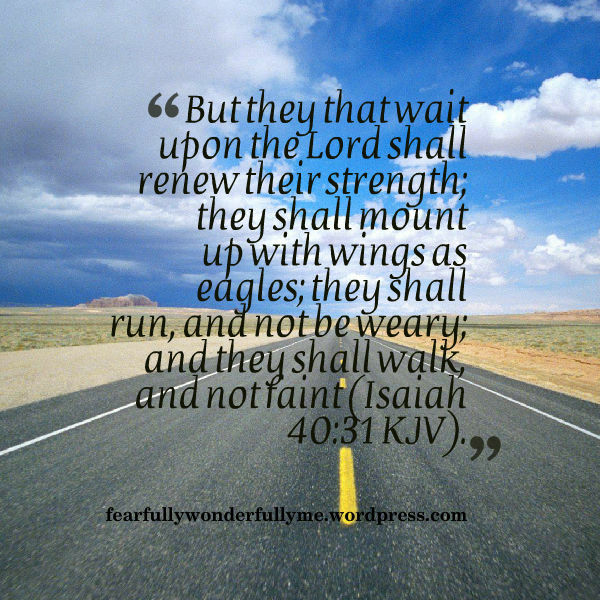 But they that wait upon the Lord shall renew their strength; they shall mount up with wings as eagles; they shall run, and not be weary; and they shall walk, and not faint (Isaiah 40:31 KJV). For more information on POTS, see the links below (do not diagnose yourself–please discuss this with your doctor!). Hi Emily, I was recently diagnosed with postural orthostatic tachycardia syndrome. I was just wondering if you were still reading your blog? Making your life just a little like hell. Yet I am with you in tempest and storm. As you let go in My Spirit’s release. Marring My beautiful world everywhere. By the embrace of My sin-laden Cross. Be of good cheer in the Message you’ve heard. Others have suffered who knew not My Word. Yours is the cross that can light up their lot. Plunge them in love by the strength of My grace. Follow My path, when the suffering grows. Cherish the Cross! It will conquer your foes! This is beautiful! Thank you for sharing and praying. I feel God moving in my life.